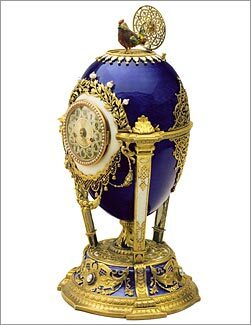 A Faberge Imperial Easter Egg presented by Tsar Nicholas II to his mother the Dowager Empress Maria Feodorovna at Easter 1900. 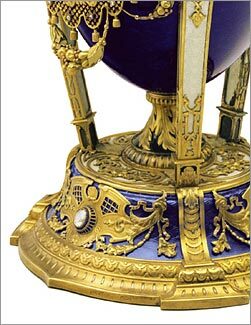 With every egg, Faberge outdid himself in technique, detail or complex mechanics. Some of the world's best examples of handcrafted automata are hidden in the jeweled shells of the Imperial eggs. 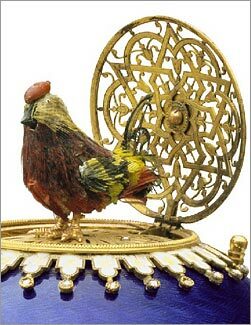 At the stroke of the hour, a ruby-eyed rooster emerges crowing and flapping its wings from the top of the elaborately designed Cockerel egg (1900). 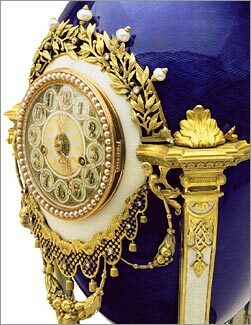 Faberge was known to have worked on the mechanism of the Peacock Clock in the Winter Palace, and his familiarity with that famous automaton no doubt inspired the creation of this egg.